My ultimate favourite cereal is Kellogg's Strawberry Mini-Wheats. Chris likes Brown Sugar Mini-Wheats and Hannah is partial to the original. Cereal is a quick, easy breakfast to prepare in the morning when the minutes are few and the rush to get out the door is looming. This winter has been a cold one - did you ever think to warm up your milk (regular, chocolate, soy, almond - whatever you prefer!) before pouring it over your Mini-Wheats to #TryItHot? When served with warm milk, this whole-grain, high fibre, family favourite is a wholesome way to beat the winter chill. Now it's supposed to be spring, and boy did it rain today. The dark, gloomy, LONG commute called for a quickly prepared dinner tonight. 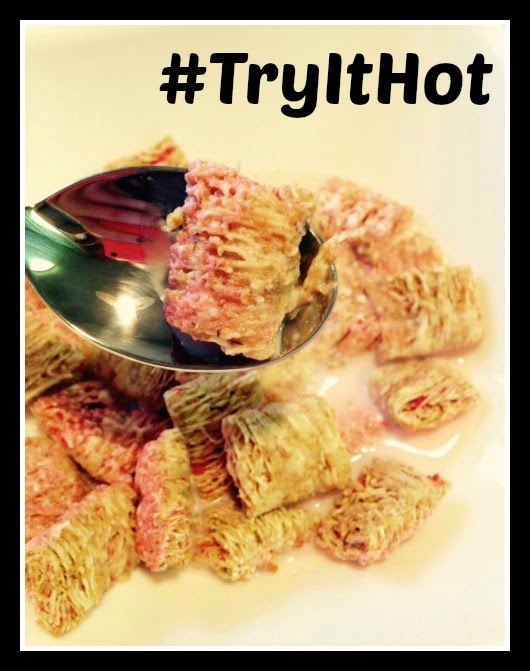 So, after warming up some milk in a pot on the stove, I tried Strawberry Mini-Wheats hot! And boy did it smell great - and it tasted like pie! Are you ready to #TryItHot? One lucky YYZ Bambina reader will win four boxes of Kellogg's Mini-Wheats and a special microwaveable bowl! Make sure you enter by April 8th, 2015! Disclosure: I am part of the Kelloggers Network. As always, all opinions on this blog are my own. © 2015 YYZ Bambina. All Rights Reserved. I have not tried them hot yet. No, I have never tried them hot before. No I have never tried them hot. i have not, but i will next time i have a box! No, I've never thought to try it hot. I've had Shredded Wheat hot but not Mini Wheats. No I have never had mini wheats hot. I have tried them hot many times. No, I just eat them cold with milk. No, I haven't tried them hot. Sure love them cold, though! I have not but there is a first time for everything. No, I've never tried my Mini-Wheats hot. I haven't tried it hot but will now. no,I haven`t ,but I will try it! I haven't, but I'd like to. It's been a long time - I should try it again! I have never tried them hot but I love them cold! I haven't tried them hot. My Dad use to eat'em hot all the time. I have never tried them hot - never thought to!!! I've never tried it hot but wouldn't mind trying it hot. I have not tried them hot. I am sure I would like it, especially the Maple Flavour one. I haven't tried them hot .... yet. I love em Hot ! No, but it sounds like I should try it! No. I have never tried them hot before. no i have never tried them hot yet, will have to try! I have not tried them hot yet ! @leisamclain I have never tried them hot ! I have never ever warmed them up but we are all big fans of Mini Wheats so maybe we will try these warm!